Dreaming of our ideal future delights and inspires us. Children, with their fertile imaginations, are particularly good at dreaming. But to make dreams come true, you need to have clear goals and, very likely, save some money to make them happen. This month, we are encouraging all our members, particularly our youngest, to write down their dreams, create vision boards, and encourage each other. These activities will help lay the groundwork for their future success. Young members who begin a habit of envisioning and recording their goals are more likely to achieve future goals as adults. We are here to help you get started. Picture it! – Post a photo or video of your child on social media (Facebook, Twitter, or Instagram), and include 200 words or more on what you picture their future to look like, and how you are saving to make their dreams a reality. You must tag Gulf Coast Educators FCU (@GCEFCU) and include the hashtag #CUYouthMonth. Every post is an entry for a chance to win a $500 scholarship for your child. Child must be a GCEFCU member. By tagging GCEFCU in the picture, you are granting the credit union permission to share your picture and story. Save for it! – Every deposit of $25 into a youth account (Sandy Saver, College Saver, or Student Checking) during the month of April is an entry for a chance to win a $500 scholarship for your child. If you deposit $100, that is four entries. If you deposit $500, that is twenty entries! The $500 scholarships will be awarded in the form of a College Saver CD. If the child does not currently have a GCEFCU College Saver CD, one will be opened for them with the $500 deposit. Disclosure: Both youth month contests are valid from April 1 – 30, 2019. Child must be 17 years old or younger and a GCEFCU member to participate. Photos and videos posted must be made public so that the credit union can view them. By tagging GCEFCU in your photo or video, you are granting the credit union permission to share your picture and story. The $500 scholarships will be awarded in the form of a College Saver CD. 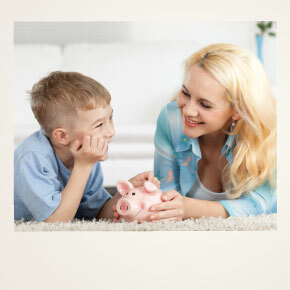 If the child does not currently have a GCEFCU College Saver CD, one will be opened for them with the $500 deposit.